Happy #guestfridayinterview day! Whether you’re reading this on a Friday or not, these interviews make every day a happy day! Today, I am so thrilled to be interviewing author Stephanie Tromly. I received her book in my OwlCrate box, which for those of you who don’t know, is a monthly YA subscription service that sends you a new book and a bunch of cute/cool little trinkets and such that go along with that month’s theme. 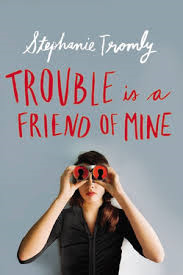 I was in between book series at the time so I picked up Stephanie’s book and started to read it and I will tell you that I didn’t put it down until I was finished! But let’s get some introductions out of the way before I really get going on her book. Stephanie, I’d like you to meet my TWPeeps (The Writing Piazza Peeps)! And TWPeeps, I’d love for you to meet Stephanie! Stephanie, how about you start by telling my TWPeeps a little bit about yourself. My name is Stephanie Tromly. I was born in the Philippines, I spent my teen years in Hong Kong, and went to college in Philadelphia. I moved to Los Angeles after I graduated and started writing there. After six years in L.A., I moved to Toronto to go back to school. I met my husband there and we moved to Winnipeg when he got a job teaching at the university there. I started writing Trouble Is a Friend of Mine after I gave birth to my son. Let’s dive into your book now, I’m so excited to talk about it. It’s a fast paced, captivating book with the fun title – Trouble is a Friend of Mine, can you tell my readers a little about it? The book has a mystery-noir/buddy comedy plot involving a missing girl, a weird cult living in a mansion, and a new-in-town high school junior named Zoe who gets dragged into solving the tangled mystery by Digby, a fast-talking eccentric who’s haunted by his own sister’s abduction eight years ago. Really, though, it’s about Zoe having problems fitting in after moving to small-town River Heights. It’s about finding friendship in strange places and how squads don’t have to look like Taylor Swift’s to be tight. It’s about Zoe figuring out her relationship with her mother. All the absurd, over-the-top stuff are metaphors for her interior emotional turmoil. Zoe is such a relatable character, I think that’s what drew me into the story. And of course Digby’s fast-talking doesn’t just work on Zoe, it works on the reader too! You can’t help but follow after him, turning pages just as fast as you can, just to keep up with his latest crazy idea. It’s definitely a book you will want to live again and again. I highly recommend it. I hate to switch gears but if I don’t do it now I’m afraid the rest of the interview will just be me gushing, so let’s shift the topic and talk about your journey to become a published author? As I mentioned, I started writing after having my baby. I’ve since read other debut authors’ biographies and I’ve noticed how very many of us say the same thing: I was puttering along until BAM the birth of my kid destroyed the old normal. I was halfway done with my PhD dissertation on Virginia Woolf when I had my son. After he came, I realized it was going to be impossible for me to disappear into a library for hours to do my research. I was sleeping in ninety minute intervals, I barely tasted my food and thought of eating solely as ‘powering up’, and I didn’t leave the apartment for forty-something days (except to see the doctor). In this fugue state, I started writing about Zoe and Digby. I escaped into their lives in ten-minute spurts of writing. I created a different world to stay sane. I remember that fugue state, well, as much as anyone can actually remember a fugue state I suppose. I’m just impressed you were able to put coherent sentences together, let alone write a whole book! It just makes me love it all the more! So you’re writing this book while taking care of a new, tiny human, like a Rockstar I might add, and then what? It took me a while to finish. It was only after I had the book done that I started looking into getting representation. This is a key detail, by the way, because I would never have had the courage to finish the book if I’d read all the bad news about the publishing industry beforehand. That’s my number one tip, by the way. Just like they tell novice climbers: DON’T LOOK DOWN. I sent queries to a few agents and a few people requested the full manuscript but David Dunton was a fast reader and a smooth operator on the phone. He’s awesome in real life, too. He liked me, I liked him…he signed me in February 2014, made suggestions for some major edits, and then sold the three-book series to Kathy Dawson Books at Penguin in April 2014. I did some light internet stalking, I believe in this business we can call it “research,” 😉 after I read your book and I saw that you worked as a screenwriter while you were in L.A. can you tell us a bit more about that? It was awesome. It was the 90s and I got there right when they were trying to make American versions of Hong Kong action films work. Quite a few of my meetings were for rewriting women’s dialogues and for punching up action scenes. I never had any formal instruction on how to write screenplays but back then, young writers had time to learn on the job. I don’t think it’s like that these days. How is screenwriting different from novel writing and how is it similar? At first, I thought it was awesome that I’d been freed from the burden of writing within the confines of a typical screenplay’s three-act structure. I soon realized, though, that the old screenwriting rules could get me out of jams. I’d write these long passages about Zoe’s feelings and then sense something was wrong without being able to put my finger on it until I’d remember something my friends and I used to tell each other when we caught each other overwriting: show it instead of talking about it. That’s the major thing I’ve realized…readers of both kinds of writing don’t want to be directed too closely in how to read what you’ve written. Your book Trouble is a Friend of Mine was published by Penguin, one of the “Big Five” major trade book publishing companies, how has that effected your role in marketing your book. I know for self and indie published books, marketing is often the bane of our very existence. I’d love to hear about what marketing is like for an author when they have a large publisher. I get a lot of support from Penguin and I am so very aware what a luxury it is to have them all behind the book. I’ve had conversations with other authors in which they’ve told me how much work they have to put into getting out there with their book. I’m super-grateful that I mainly just have to write. I mean, so far, most of my post-publishing activities have been tweeting and answering interview questions online (except for attending the Texas Teen Book Festival) because I’ve been living in Hong Kong for most of 2015. I’m back next year, though, and I understand that they want me to do more ‘in person’ things for the paperback release in June. That sounds like a lot of fun to me. I just want to be told where and when to show up. LOL. I’m very honored that you took the time to answer my request for an interview. You’re making me feel so official! These interviews always leave me feeling a bit awed. While I have you, I’d like to pick your brain for a bit on some advice. I have a number of readers who are authors themselves, or aspiring authors. So I like to do what I can to help them out. A question I love to ask is, what’s something you know now that you wish you knew before you started? Ah, the dreaded “deadline” haha. That driving force that can keep us on track or push us to the brink of insanity. That is something to consider for those contemplating a career in novel writing. It is much different when you have expectations for having a book completed by a certain time versus just writing when you want to. Do you have any last advice for writers who are writing and/or attempting to publish their work? But this is destructive thinking. Just write your book and get it the way you want it before you start thinking about how other people will feel about it. I love that! Don’t look down! And that’s so true. Writing can be such a devastating endeavor. We artists often have much thinner skin when it comes to our art. It’s important to have positive people in your life that can build you up because there is more than enough out there to tear you down. And I can’t even imagine a world without your book in it! Speaking of your book, are you currently working on another book? Please say yes! Yes! Trouble Makes a Comeback in 2016! And because I know how intelligent my TWPeeps are and that they will all want to purchase your book right away, where can they do so? The book is available in stores and of course, on Amazon. So if you’ve got an indie store near you then head out there right away and ask for Trouble is a Friend of Mine and if you aren’t fortunate enough to have such a store nearby (like yours truly) then be sure to purchase it on Amazon. Stephanie, thank you so much for your time and for being a guest on my blog! Thank YOU, Kara, for having me. I’m always so excited to connect with people who’ve read the book…it all makes it real. Thanks for listening to me squee about your book. I can’t wait to read your next one! And on behalf of Stephanie and myself, thank you to all you wonder readers for stopping by The Writing Piazza, you are the reason we put these interviews together. We love spending time with all of you, you make all the work that goes into even one of these interviews worthwhile. If you’d like to read some of the other interviews we’ve done here on TWP, you can check those out here! There are some other great resources for writers here too, you can check those out here.